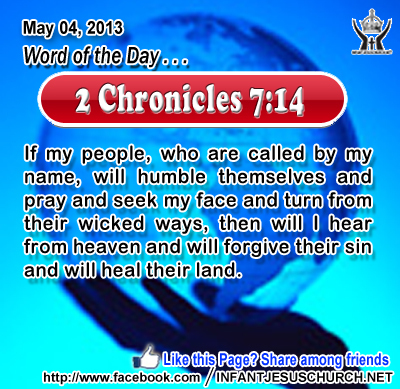 2 Chronicles 7:14: If my people, who are called by my name, will humble themselves and pray and seek my face and turn from their wicked ways, then will I hear from heaven and will forgive their sin and will heal their land. Heavenly Father, your deeds are awesome, your faithfulness is overwhelming, and your mercy and grace are such blessings. Yet we come to you knowing that you hear us, despite the incredible distance between you and us, between your worth and holiness and our lack. We confess that we, and our culture and country around us, have made a mess of what you so wonderfully blessed us with. We come humbling asking that you reassert yourself in our nation at this time in clearly recognizable ways. We ask this in Infant Jesus' name. Amen. 18"If the world hates you, know that it has hated me before it hated you. 19 If you were of the world, the world would love its own; but because you are not of the world, but I chose you out of the world, therefore the world hates you. 20 Remember the word that I said to you, `A servant is not greater than his master.' If they persecuted me, they will persecute you; if they kept my word, they will keep yours also. 21 But all this they will do to you on my account, because they do not know him who sent me. True love of God and his ways bring us to all that is lovely, truthful and good. If we truly love God then we will present to his truth and obey his word. A friend of God cannot expect to be a friend of the world because the world is against God. Jesus' demand is unambiguous and without compromise. Do not love the world or the things in the world. If anyone loves the world, love for the Father is not in him. We must make a option either for or against God. Do we seek to please God in all your thoughts, actions, and relationships? Let the Holy Spirit fill our heart with the love of God. Loving Infant Jesus, may the fire of your love fill our heart with an eagerness to please you in all things. May there be no rivals to our love and devotion to you who are we all.